Elder H.B. Holmes, Jr. - Lakeland. Sandra G. Bennett - Lakeland. How often does your family get together? Some Davis Family members after a reunion banquet ... 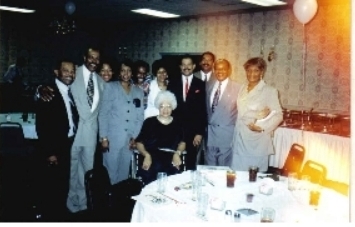 Standing left to right: Roland Lucas, Bill Moore, Valerie Hines, Doris Moore Bailey, Patrick Hines, Dorothy "Dot" Moore Knight, Beverly "Bev" Milton Bailey I, Gregory Rhoden, Freddie Hines, Gloria Dubose Lucas, seated Gloria Douglas Hines. Share Your Family Reunion Information With "Family Reunion Central" and We'll Post It On This Page. Tell us about your family! Complete the form below and send us your family pictures, next reunion date and location, year of first reunion, number attendees, oldest family member's name and age, pictures of t-shirts and family tree design, crest, shield and family motto. We'll post it here at "Family Reunion Central". Allow us to assist you with your family research. "Family Reunion Central" provides an on line community where you can post your family information. Post today, do not delay. See research links to assist with your family genealogy. Post your information, then contact your family members or send them a link to view your family posting. This page is designed for families by "Family Reunion Central" (FRC). You may post as often as you like and we shall post your information within three business days or 72 hours from date of receipt. We realize at FRC how important families are and how important families gathering are too; therefore, our goal is to link family members with pride. You may refer to the Genealogy page for family tree development CD's and other professional services. Contact FRC for family tree development price or other inquiries. We appreciate your trust in our services at FRC ... were we believe in "Making Business Personal". Hours of Operation: Monday-Friday from 10:00 a.m. - 5:00 p.m.
(C) Copyright 2005-2012. The Bailey Group. All Rights Reserved. in boys and girls lives. Bailey Communication produces many voices who will provide quality information, which covers the gamut. Profile: Genealogist, Researcher, the only African American National Underground Railroad Freedom Center (NURFC) Consultant and Instructor, and veteran law enforcement officer Bennie L. Phifer III, West Chester, Ohio.